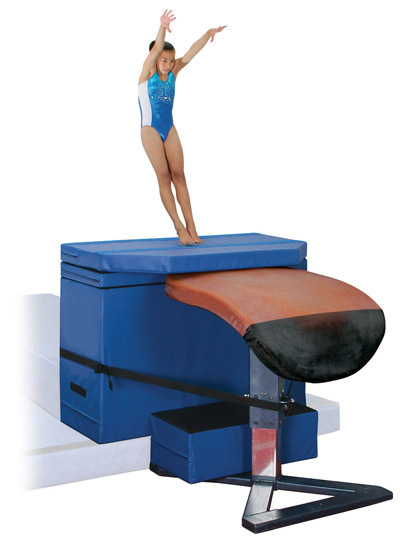 Gymnastics Equipment - Vault Training - Block & Blast Vault System - Norbert's Athletic Products, Inc.
Handspring, Tsukahara, and Yurchenko training blocks to improve your gymnasts' height and rotation. Start your Compulsories learning the NEW Level 6 & 7 vaults now! Using this system your athletes will be ready for next year’s season today! Height block adjusts system to fit a 12cm or 20cm landing mat and/or 3 different heights 115cm, 125cm and 135cm. 4" and 8" Blast Pads to raise take off surface above the vault. CLICK HERE to see video demonstration. CLICK HERE to see video testimonial.